Visit Guinea Station on the CSX line. find one of the geocaches in the Railroad Knutz series while you are there!! Here is an image of Jackson in what would become his deathbed at Fairfield Plantation near Guinea Station. He succumbed to pneumonia about a week after being shot in the arm by a friendly fire incident during the Battle of Chancellorsville. His injured arm was surgically amputated near the battlefield and then he was transported by ambulance to the relative security of Guinea Station well south of the fighting. We hope that you will have the same great pleasure we did of meeting Ranger Chapman whose forebears served under the command of Gen. Jackson and who recounts the stories of the general's life and passing with great verve. For hours that the Stonewall Jackson Shrine is open please check the National Park Service webpage for the shrine. So that you can log this cache as being found, be sure to record your visit in the Register of National Park Visitors before leaving and look back in the register to November 2012 to find the entry made by Dave Self; the password you need to enter to verify your find is the day of the month that this visitor signed the register. If you are working on completing the Railroad Knutz series, the digit you need for this RR Knutz: Guinea Station cache is that same number. Great thanks goes to the National Park Service which granted permission for the publication of this cache. This cache is part of the Railroad Knutz series by the Cachew Knutz. For information about the series and the fabulous golden spike for the first to find the whole series, please check out the ultimate cache in the series, RR Knutz: The Golden Spike. As morbid as this cache may be, there is an even more morbid one related to Stonewall Jackson. His arm, after it was amputated, came to be buried in a known location and its burial site is marked at Ellwood Manor near where the amputation took place. 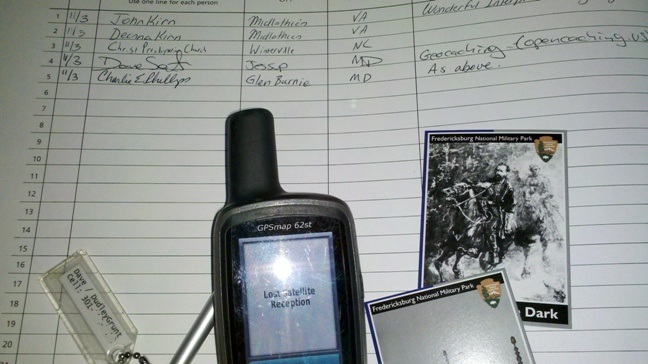 Please read more about this virtual cache at Stonewall Jackson's Arm. Yah, I get another digit on the list! Now I am making progress. I think the college student showing the house was glad I arrived. He was more than willing to show me the book. Even helped me find the right page. He told me a little of the place and let me look around. I thanked him and went on my way. It was a quick lesson and smiley in my GSAK book. (and one digit closer to the final) Thanks for placing and exposing to other sites. Had to reread the description a couple of times and then took a few minutes to find the right entry. Thanks to Dudley Grunt for the verification info in the notes. I think I am just over 1/3 done with the series and having a great time. My 200th OpenCaching North America find! 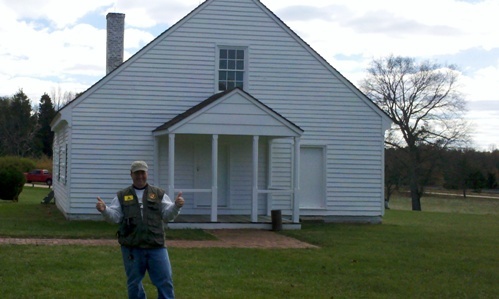 I came down to the Fredericksburg, VA area and beyond wtih sfcchaz to seek out some special caches (OCUS, TC, and GC Virts). I'd visited once before, but got here just after closing (see below). Today, we took the grand tour and chatted to the Park Ranger about geocaching. Unfortunately, we found that the guest book was replaced on 9/25/12. Got pics with signatures and GPS on the guest book, though.